Why I read this book: I've always loved Shaw's quotes. I wanted more. Just a warning before we begin. I go a little into detail about the relationship between Eliza and Henry which includes commentary about what happens after. If you have not seen the play and want to be surprised, be warned. When I was in high school, I tried out for Pygmalion. I didn't get any part and in my anguish did not go see the show. I had heard that My Fair Lady was based on this play, but I've never seen that. I've read the myth about Pygmalion, but honestly didn't make the connection until I was reading the footnotes. So suffice it to say all I knew about Pygmalion's Eliza and Henry I learned from Family Guy. So with practically a clean slate I dove in and I must say I rather enjoyed myself. I've always liked the quotes I've seen by Shaw floating around the internet, but never made the connection to the playwright. It was interesting, surprisingly funny and quite entertaining. I could see in my head some of the cues onstage and how well they would work. I enjoyed Eliza and Henry's interactions the most, and was honestly quite confused by the ending. I clicked next page and there was no more play, but a nice essay by Shaw about what happened after. Toward the end there is quite a conversation between Higgins and Eliza which to me it dripped with sexual tension, but that was just my romance novel reader brain apparently. Because that is not how it ended. It was really interesting reading Shaw talking about why he chose to end the play the way he did going against what the mainstream public would want. Apparently, he added this afterword because everyone kept asking, but why can't they be together? There have been times, wikipedia told me, that certain directors have changed the ending to suit the happiness of the audience, but I understand where Shaw is coming from. The play he wrote is a jab and society. Its a comedic satire, not a love story. There is no need for a happily ever after, because this is supposed to be real life. It's interesting also because the myth of Pygmalion has the sculptor living happily ever after with his creation, so he even deviated from the source material. I don't know how I feel about changing the ending to suit the coffers. Part of me says "If you don't like it, write your own play!" but the other part of me says "Gotta do what's best for business." I am not really curious to see how My Fair Lady ends but I would tend to be more lenient about this seeing as it is an adaptation of the play. So in conclusion, this really is a great play. I really enjoyed it and would love to see it onstage at some point. Well, I saw the movie adaptation version, My Fair Lady since then and (outside of the fact that I thought it overly long.. but that's a different story) it bothered me that it changed. It gives the feel of the movie something different from what Shaw intended. There are so many times when this has happened to me, where Hollywood changes some key piece in a treasured piece of literature (I still refuse to see The Golden Compass) and just changes it. Completely misses the point. Sometimes I guess it works out okay. After about three viewings of Return of the King, I felt comfortable with the changes. And yeah there are definitely times where movies make an obscure book known to mass culture. But overall it just makes me sad when things get changed, especially when it changes the intended meaning. So I open it up to the floor. How do you all feel about books being made into movies and the changes that inevitably happen? This is a fantastic and awesome and wonderful review. You know why? Because it means I'm not alone. The ending is completely different, isn't it? I mean, the whole feel of the story is completely different from play to movie-musical. I totally wrote my senior year high school research paper on this very thing. No lie. I took the original myth, the George Bernard Shaw play, and My Fair Lady, and I compared and analyzed and rambled on about what's better, what's worse, etc. 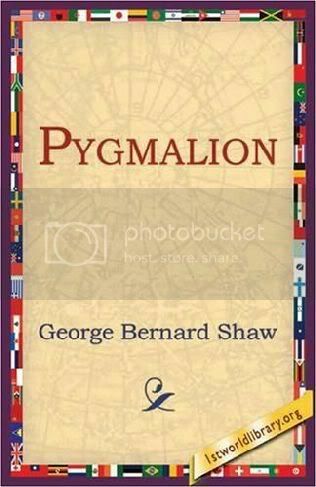 I don't have much comment on Pygmalion, but I have mixed feelings about adapting from novels to films. Sometimes they work out very well or even better, but most of the time, the novel is much more daring, detailed, and intelligent. I love this play! I've read several of Shaw's plays and have enjoyed them all. The ending never bothered me. It was surprising but felt real somehow. I do like the movie My Fair Lady. I love Audry Hepburn though. I have a vinyl of the soundtrack. "The rain in Spain falls gently on the plain." hehe. It's nice to find another Shaw fan! @Ashley Yeah my version of the book (barnes and nobel classic) has a nice little essay by Shaw that said what happened. This is what actually led me to find out why he felt compelled to write it and wikipedia told me all I needed to know. Even before MFL the people putting the play on a few years after its publication changes the ending to get more revenue.